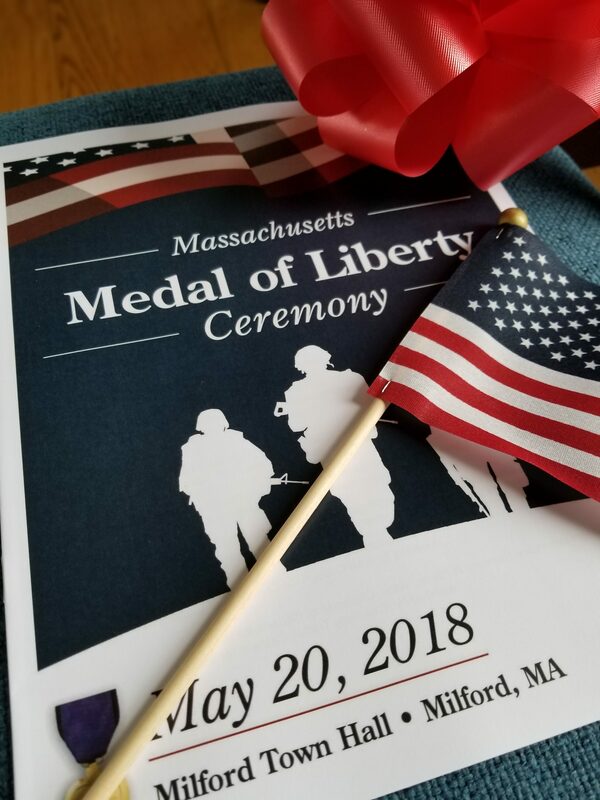 The Milford Medal of Liberty Committee and Citizens for Milford held the Massachusetts Medal of Liberty Ceremony on Sunday, May 20, 2018 in the Grand Ballroom of Milford Town Hall. This ceremony honored the service and sacrifice of over forty Milford servicemen who were killed during World War II, the Korean War, and the Vietnam War. The highlight of the ceremony was the presentation of the Massachusetts Medal of Liberty to the families of these heroic members of our community. Each family was also awarded citations from Governor Charlie Baker, U.S. Congressman Joe Kennedy III, Massachusetts Senator Ryan C. Fattman, Massachusetts Representative Brian Murray, and the Milford Board of Selectmen. Read the bios of Milford’s fallen heroes. Check out photos from the ceremony on our Facebook page. We extend deep appreciation to every individual, group, organization, and business who helped make this ceremony a memorable one for these honored families. Read the list of volunteers and donors here.